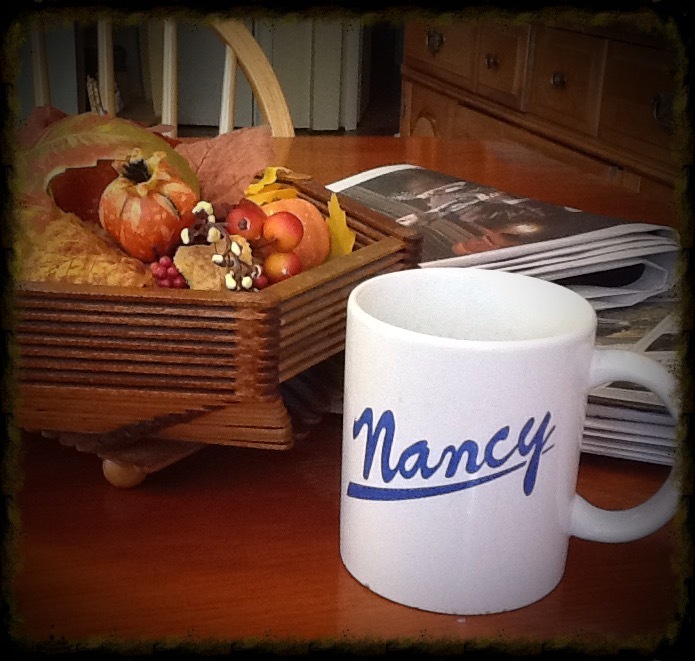 If we were having coffee…on this bright, crisp afternoon in Southern New Jersey, I would say, “Sit!! Relax! Please pardon my PJs!” Today I’m feeling lazy and enjoying, what feel like, the first “do nothing” day in forever!! Although last Sunday I was also doing nothing but that was because I’d gotten socked with a combination flu-sinus infection so I guess it’s actually the first chose-to-do-nothing day. I’m still dragging a cough around with me but at least I no longer feel as though I’ve been hit by a bus. So, happy February! I’m pretty psyched that Punxsutawney Phil didn’t see his shadow and that Spring is just around the corner. Let’s face it though, Phil’s gonna say whatever gets him back in his warm bed the fastest. Personally I’d have bitten the guy with the hat the minute he reached in my door, but I’m a bit cranky in the morning anyway. If we were having coffee… with I’d tell you all about the wonderful visit we had last night from my nephew Kyle and his fiancé. They are visiting from California and its the first we’d seen them since they got engaged. If you happen to have read my yet-unfinished-series “Adventures in Hollywood” you might remember that it was Kyle that my sister Linda and I went to visit last November. He showed us the sites and we met his lady then although they weren’t betrothed at the time. Her name is Tuka and she’s originally from Persia/Iran but has been in the US since she was a little girl. She brought the most amazing eggplant dip to share. We plied her with typical Jersey food (hoagies and Tasty Cakes!). We are definitely smitten with her and cant wait for the wedding. They are talking about a destination wedding to Iceland so they can be married under the Northern Lights. Sounds very romantic but I’m not sure how it will fit our budget! Guess we have a few years to think about it. Well, I do need to get a few things done today so I guess I should finish up this chat. I hope you enjoyed your French Roast and conversation. Please stop by Eclectic Allies‘ and visit the rest of the Coffee Share Posts! The biggest hurdle I’ve had with this was not finding the motivation, but finding a convenient space where I could spread out and not have to put everything away each time my family needed to have a meal! Some of my supplies were down in the basement, some in the kitchen hutch, a few in the pantry and even my bedroom closet! Well that’s all changed now! My husband slaved through the last few weeks of the summer renovating what was formerly the kids play area downstairs (I mean, our youngest is 20, I think they are past needing it!) He moved his collections and “man cave” stuff down there as well as our guest area, freeing up our smallest bedroom for my art space. Yay! Weeks were spent clearing out the room, stripping wallpaper and painting the walls a nice bright white. We are planning on replacing the carpet with a clean grey laminate but I’ll have to save a bit more for that. I’d purchased a smaller, black desk for our computer, which will still share the room so that was moved in. The final step was assembling the amazing new art desk my wonderful hubby had given me for my birthday back in December. It’s got so many compartments and it’s on wheels! I’ve been picking up items here and there, curtains and cool storage containers (Anyone who knows me can tell you I get weirdly jazzed about organization!) My sister had a nifty little bookcase up for grabs (we actually traded her the bed frame from that room that we no longer needed-win/win!) and I was able to find a desk chair that looks brand new for just $25 on one of those online yard sale sites. Then….FINALLY….this past Sunday, I collected my many art supplies from their many hiding places and put them away in my very own art room!! I’ve been like a kid on Christmas morning, just giddy with excitement and creative motivation, painting and experimenting with new techniques. One of the best parts is thatI can just leave it all out, ready for the next time I find a few minutes to create. I do have to remember to close the door, though, so the cat won’t walk through the wet paint or eat the brushes. She’s like that! I’m hoping that this new found creative jag lasts a long, long time making 2019 the year of creativity! It just goes to show that sometimes resolutions or plans can take some patience, a bit of elbow grease and a little faith but they can happen. May all your plans for the coming year be every bit as gratifying! So far so good. We did tie the tree to the wall, just in case. My day today is a whirlwind of last minute have-to-dos. Sorry, no time for coffee or cake today, but I do want to pass on a holiday wish to my blog buddies for a healthy, happy Holiday Season! Merry Christmas, to my friends who celebrate, and a very joyous New Year to all! When you work with children during this time of year, sooner or later one of them will ask, “Do you believe in Santa?” I usually give a quick “Of course I do!” then change the subject because there are some cans of worms you just don’t want to open, especially with other people’s children. in listening to others, their wants and needs and acting on them. I believe in Christmas Elves. in the satisfaction of a job well done. in being steadfast and reliable and occasionally attempting the impossible. I believe in the Christmas Star and the Christmas Spirit. and in trusting that there is still so much good in the world. Good morning and happy Sunday! It’s a bit damp and drizzly here in South Jersey today but it’s warm and cozy inside so sit down, have a cup of hot French roast and lets have a chat! If we were having coffee…I would tell you that Miss Dee and I spent our day yesterday putting up Christmas decorations. I would admit that when we started, I was feeling slightly overwhelmed and less than enthusiastic but as we unwrapped each treasure, my mood improved. Soon, she and I were remembering stories and laughing at memories from holidays past. I would then show you the Christmas Village, originally just four lighted houses, purchased at a home demonstration back when D-man and I were newlyweds still collecting holiday decorations. Over the years we have added more houses and tiny figures. The job of setting it up has been handed down from me to Miss Dee. I think she does a wonderful job, don’t you? Next we can check out the bookcases, my favorite pieces of furniture! On those, we have a mix of old and new, a framed Christmas card I designed as a teenager next to baby photos of my now grown children. Up on top are some reindeer, candle holders from who knows when alongside a new white ceramic one purchased last year. Down on the floor is the tall wooden tree I painted and decorated years ago. I always struggle to find the proper place for it but I’m thinking it looks quite at home next to our stuffed snowman there in the corner. On the other bookcase sits our mini tree collection. Here there is a potpourri burner, a gift from an old friend 20 years ago, a musical tree that plays “O Tannenbaum” and several others both decorated and natural. You can also see our newest decoration, the white car that is toting the Christmas tree on top. I came across it at Lowes last week and just had to have it. It reminded me so much of my childhood! I was flooded with years of memories, watching my dad strap our tree to the roof of the car. I worried the whole way home that it would blow off! The shelf below holds the manger, also a gift from a dear friend on our first Christmas. This is displayed each year without fail to reminded us of the true meaning of the Holiday Season. We would then swing through the hall so you could see my Dicken’s Carolers. They were purchased second hand over the years so they don’t actually match but I appreciate them each for their uniqueness. The boy on the right refuses to stand correctly so we had to tape him to the snow. I’m hoping he doesn’t topple over taking the rest of the crowd with him! I think I love them so much because the music of the holidays instantly fills me with Christmas cheer. I wish I’d been able to Carole more often as a child. Miss Dee told me yesterday that they kind of “creep her out!” It must be the eyes. Guess I won’t pass them on to her. That would bring us back to the kitchen, where the hutch that belonged to my in-laws when they first got married, is packed with more memories. On one shelf sits my mom’s Christmas tree glasses and on another are our reindeer mugs that we bought when the kids were young. Each one features a different one of Santa’s reindeer. Miss Dee always uses “Vixen” and Mr D always uses “Donder.” I’m a little more flexible. Today I have “Cupid” but other days I feel more “Blitzen-ish!” The little nutcrackers are actually place card holders, although I’ve never used them as that and the tray propped up behind was painted by my mom during her ceramic phase. On the back is scratched “Christmas 1977,” the year I turned fifteen. If we were having coffee… I would tell you, as we sat back at the table and refilled our mugs, that I’m glad Miss Dee nudged me on yesterday and encouraged me to unpack “just one more box.” I realize now, after taking this tour with you that it helped me see past the “I’ve got so much to do!” mindset and instead reminded me what amazing memories we can make when we open our hearts and homes at Christmas! Thanks so much for stopping by! Please take the time to visit some of the other Coffee Share Posts hosted over at Eclectic Allie. Thinking back to the Thanksgivings of my childhood I remember waking to the mouthwatering smell of turkey roasting in the oven. I recall staggering out of bed and curling up in front of the TV to watch the Thanksgivings Day parades. My favorite was the Macy’s Parade with the giant balloons and the appearance of Santa Claus, but mom loved the flower covered floats of the Rose Bowl Parade so we would take turns switching back and forth. 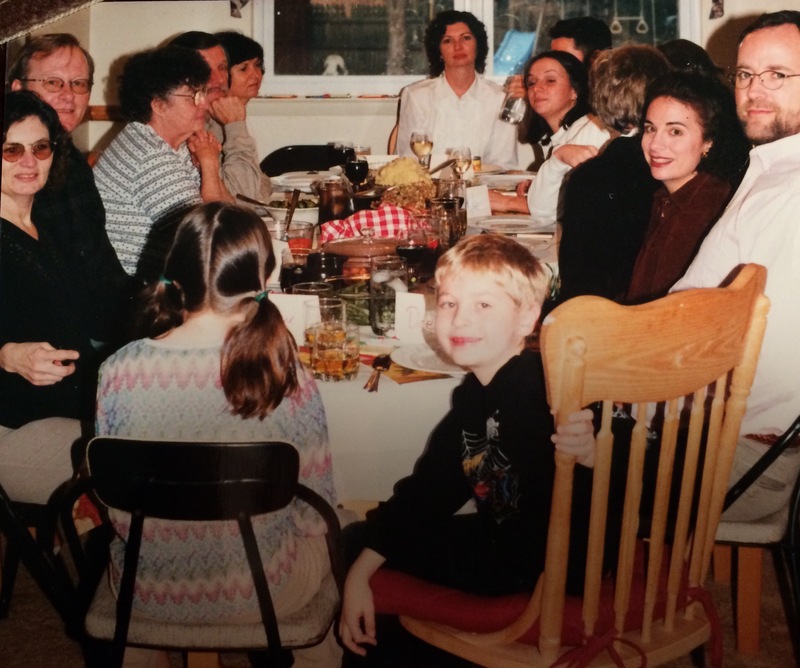 The Thanksgiving of my childhood. My sister, mom, dad and grandmother at the table in the living room. 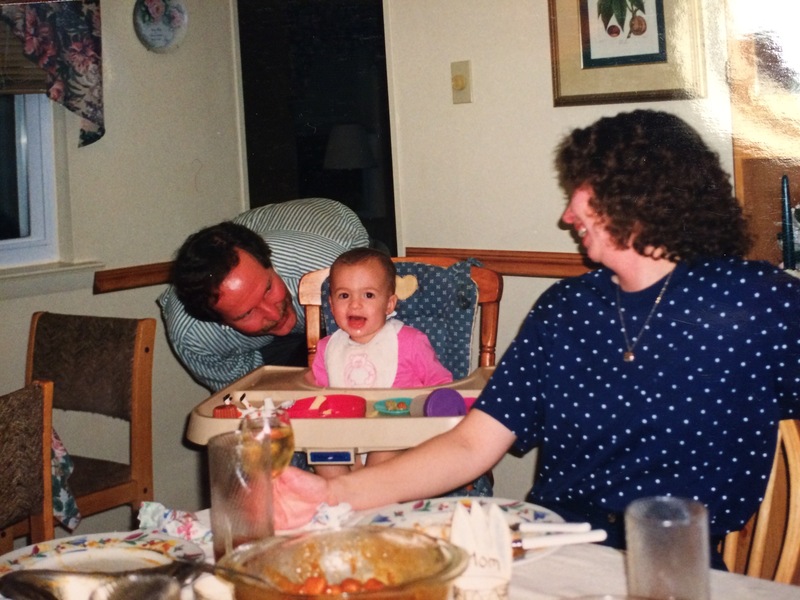 I remember trying to stay out of the way as my dad and brother maneuvered our dining table through the tiny kitchen door. They would set it up in the living room and add the extension leafs and folding chairs to accommodate all the dinner guests. Then I would help set the table with the good white table cloth, the plates we borrowed from my grandmother and mom’s special cut glass dishes we saved just for the holidays. I think about the wonderful dishes we passed around the table, the stuffing and the candied yams covered in sweet buttery syrup. 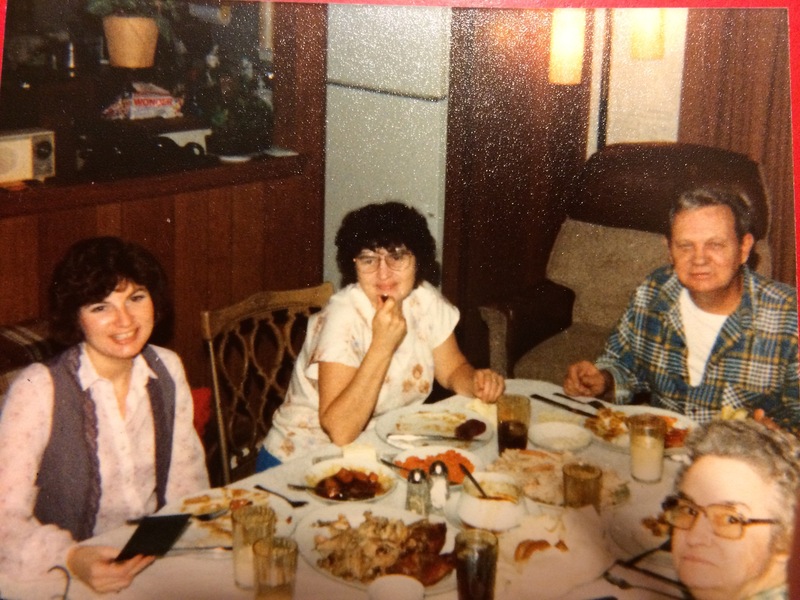 I also remember that mom made two special vegetable dishes, favorites of my fathers that she only made for Thanksgiving and Easter: creamed cauliflower and Brussel sprouts. Now, as an adult I would enjoy them too but back then I passed them down the line and filled my plate with mashed potatoes and carrots instead. My husband and I with Miss Dee’s on her first Thanksgiving. I remember how, when the turkey was crisp and succulent, dad would use our handy electric knife to slice off as much as he could making sure to include lots of dark meat, my grandmothers favorite. He filled the platter to overflowing and then refilled it when we were ready for seconds. After dinner he would trim off as much as he could and wrap up the remainder for my grandmother to use for turkey noodle soup. 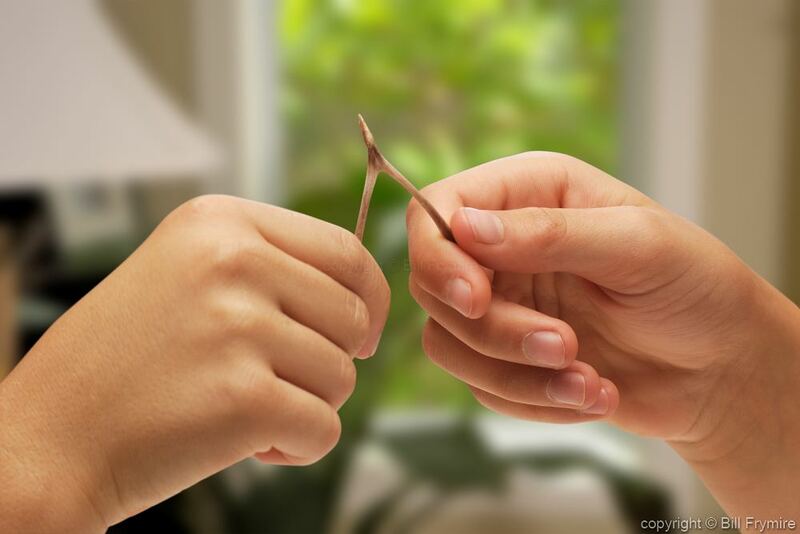 I always made sure he saved the turkey’s wishbone so one of my sisters and I could each take a side, make a silent wish then pull it apart to break. The tradition was that the person who ended up holding the largest half would get their wish. I think about how, the day before Thanksgiving each year, my dad would to climb up into the attic to retrieve the big roasting pan my mom used for the turkey. The kitchen in our tiny ranch style house had very little cabinet space so the pan lived in the attic between uses. I really remember (probably because the story has been told over and over) how one year after dinner my dad was trying to help get everything cleaned up and inadvertently put the roaster back up in the attic before anyone had gotten a chance to wash it!! 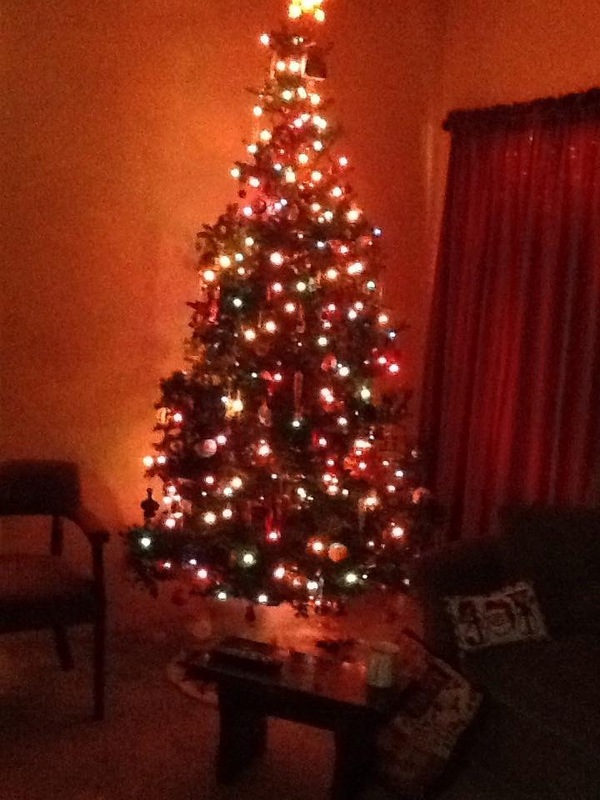 Boy was that a surprise when he pulled it back down at Christmas! I suppose they were happy it was just up there from November to December during the cold weather and not from Christmas to Easter! Our current Thanksgivings are hosted by my brother and sister-in-law. The family has certainly grown! More than anything, though, when I think back to the Thanksgivings of my childhood I think about the wonderful feeling of togetherness, the warmth, the laughter, the many blessing we had. I’m extra thankful that I’m able to carry on those traditions with my husband, children and the family we have today. I hope my children will always remember their childhoods just as fondly. What memories are you thankful for this holiday? Good morning! If we were having coffee here in Southern New Jersey we would be enjoying brilliant sunshine and crisp Fall temperatures. I would fill your cup with some nice hot French roast and explain that I am AOK with the cold as long as that big yellow thing is in the sky. This is much better then the mess we had on Thursday! Our area was a blanket of snow accompanied by sleet, hale and wind. Yuck!! I don’t really mind snow just not this early in the season and not with all that other fun stuff. Nope, I am in a much better mood today. Believe me, you wouldn’t have wanted to share coffee with me a few days ago! If we were having coffee…I would ask about your plans for today and tell you that my day is relatively free and that I’m quite ok with that. Having a somewhat introverted personality means that I relish schedule-free time. My brain and body relaxes. Miss Dee is very much an introvert as well. For example, this Monday she was on her way back up to school all prepared for a test in class Tuesday morning and a lot of studying and work before her next class Wednesday evening. However, when she stopped, ten minutes from home to fill up her gas tank, she received a text from her Tuesday professor explaining that he was stuck at the airport in Florida due to engine issues and would have to cancel class the next day, so she turned around and came right back home! She said she did a little happy dance in the front seat of her VW because, to an introvert, there is nothing better than canceled plans. Not everyone will understand that but I bet some of you will! If we were having coffee…I would tell you that I don’t think young Mr D will be enjoying his day off as much as I will. The children in his classroom have shared their germs and he is down with a head cold and some respiratory issues. This is on top an abscess tooth he had to have root canal on this Tuesday! I’m glad next week is a short one because he is going to need some time off. The D-man and I have been working in the school system for many years and have built up our resistance. Guess he still needs to build up a few more or, maybe change to a profession where people don’t sneeze or wipe their hands on you! If we were having coffee…I would ask you if you were ready for a refill and maybe a piece of cheese danish? No homemade goodies today, I’m afraid, although the D-man is planning on making a white chocolate cranberry cheesecake for Thanksgiving. It sounds yummy! I’ll save a piece for you for our next coffee date. In the meantime, tell me about your week and then we can go visit the other Coffee Share Posts hosted by the wonderful Eclectic Allie. Relax! Put your feet up! I’ve got loads of time! Our newest family member has an unusual way of relieving her thirst so I thought I’d share, just for fun. Happy Sunday! If we were having coffee… on this blustery South Jersey morning, I would invite you in, offering a cup of strong French roast or tea if you prefer. I would apologize for my long absence from the Coffee Share siting that life simply got in the way for a bit. You’d completely understand, I’m sure. Things have been happening around here, I’d explain. In the months I’ve been away, young Mr D has graduated from college and moved into the working world, still finding his way but moving forward just the same. My darling Miss Dee is working her way through her collegiate junior year, shuttling between home and a university 45 minutes north. She’s become very disillusioned with said university, both the classes and living away so has decided to return to our local college next semester. This is a happy decision for me because it will lighten my worry field a bit! As for me and the D-man, we’ve just been tap dancing through the school year, working on some home renovations and enjoying time with friends and family. What more could we ask! If we were having coffee…I would say that while on the topic of friends, I was happy to spend this past Sunday in the company of my oldest and dearest, four girlfriends I’ve know for over thirty-five years! How wonderful and relaxing it is to keep company with people who know you so well and share so much of your history. We’ve grown into such diverse, busy lives; one a single working mom, one a divorcée with grown children, one a retired widow and one like me, married and finishing up raising her children. We find it impossible to get together more than a few times a year and yet, despite the time and our differences we still connect the moment we get together, talking in an abbreviated language only we understand and laughing at old jokes only we would get. One friend just returned from London where she went with her daughter to cheer on our local Philadelphia Eagles football team, and one just returned from Spain where she visited her daugher who is studying abroad. As you can imagine, we had lots to talk about! If we were having coffee…I would tell you that we took advantage of our school holiday yesterday by hopping on over the bridge to Philadelphia and visiting the Museum of the American Revolution. It’s been open for a few years now but we’ve never had a chance to go before. My whole family are history buffs, in fact, my father-in-law taught high school history several careers ago! He is like our own private tour guide when we visit historic places! This trip, however was just me, D-man, and Miss Dee. The Museum, located at 3rd and Chestnut, right near the historic district, is set up wonderfully efficient, starting with an introductory film about the Revolution, then winding through a circle of displays chronicling it from year to year. There is a giant replica of a liberty tree complete with an actual section taken from the last one that stood in Boston. They have artifacts and stories from soldiers on each side and the civilians caught in the middle as well as lots of interactive displays. I found it interesting and informative especially the section on how the Revolution effected the Native Americans, which is a subject that isn’t given nearly enough attention. Probably the most important artifact on display there is the tent that housed General George Washington through out the war. Amazingly it survived in remarkable condition, handed down from generation to generation and donated along with his personal duffle bag to the museum when it opened. What an incredible part of American History. Miss Dee channeling her inner revolutionary by sitting in a replica chair from the first Continental Congress. It was a great way to spend a rainy Friday and I would highly recommend a visit if you find yourself in the Philadelphia area. Tickets were more than reasonable,($19 for adults with a discount for students and educators) and parking at a nearby garage was less than $20. Well, if we were having coffee…I would probably notice that it was time to start my day. The bathroom won’t clean itself and the groceries won’t magically appear in the pantry.<sigh> Thanks so much for stopping by and letting me catch up a bit. Hop on over to Eclectic Allie and catch up with a few more friends or even join in Weekend Coffee Share yourself. I’d love to hear what you’ve been up too! I would like to wish all my mom friends out in the blogosphere a very happy Mother’s Day. I think we can all agree that being a mom is the most wonderful, challenging, frustrating, agonizing, amazing, and rewarding job there is! Sometimes all in the same day!! Since I am no longer able to celebrate this day with my own amazing Mom I thought that in her honor I would share ten fact about her that helped make her so special. Mom with her brother Bobby in 1936 and as a 16 year old just after she met my Dad. Her name was Doris Mae and she was born in Camden, NJ in 1930. Doris went to 10 different schools in 9 years. This was because her father, a master plumber (someone who installs plumbing systems in ships or large office buildings) had to move around a lot for his work. She often returned to the same school district a few years later, catching up with old friends. Her oldest friend, Ruth, was an eighth grade classmate who became a life long friend. After my dad passed away they bought neighboring condos and continued to watch out for each other. Her two favorite fashion accessories were high heels and lipstick which she always made sure she had on whenever photos were being taken. She met my dad in 1946 when she was 16 by way of her best friend Gertie who happened to be my dad’s cousin. He was 23 at the time and fresh out of the army. I remember telling her that she would have locked me in the closet if I had tried dating a 23 year old When I was that age. Her response: “Things were different back then. He was a friend of the family and I was much older at 16 than you were.” Probably all very true. She became a mom at 20 when she gave birth to my sister Linda, a name she picked out after hearing a coworker by that name. She said it was very original for the time. Linda was followed by Patricia 18 months later, James three years after that and then (surprise!) me 8 years later. She loved to socialize and always had many friends spending time on the telephone or chatting over the back fence with the other moms in the neighborhood. Her cocktail of choice was a Fuzzy Navel: peach schnapps and orange juice. I still have a bottle of peach schnapps in my pantry that we kept on hand so she could have one at our holiday gatherings. She and I took a road trip to Florida in 1993 because she wanted to visit Universal Studios. She was afraid of flying and my dad hated to travel so since I was single and was driving a pretty reliable car at the time she offered to pay for the trip if I would be willing to drive there. It was a fabulous vacation and I’ve never laughed do much in my whole life. We made a detour to Clearwater on the coast so she could visit her cousin and made of point of borrowing a swimsuit so she could swim in the ocean, something I never remember her doing when I was growing up. 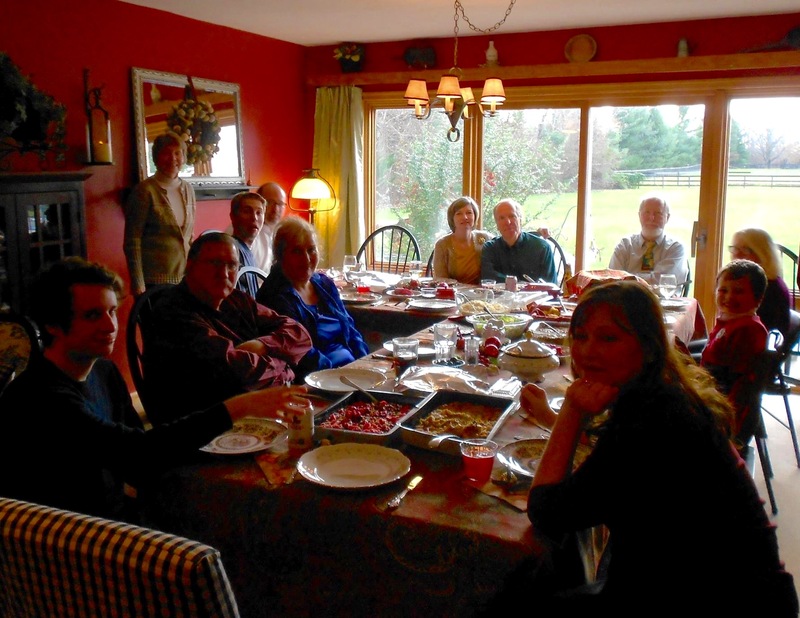 By the time she passed away, in 2015, Doris had been blessed with 8 grandchildren, 10 great-grandchildren and countless other “adopted grandkids” that lovingly referred to her as MiMom, a name chosen by her first grandchild. This aspect of her life was by far her most favorite. I could go on. There are so many more memories I could share. Maybe I will make this an annual post. For those out there who are also missing their moms on this special day, maybe you should take the time to make your own list, even if it’s just in your head and your heart. It’s a great way to remember those ladies who helped make us who we are. Enjoy the little things in life, because someday you'll look back and realize they were the big things. If We Were Having Coffee…Lazy Saturday. If We Were Having Coffee….BRRRR! Learning how to create a new life from scratch on a budget: Family, Food & the things I love. You know all of those things you've wanted to do? You should go do them.